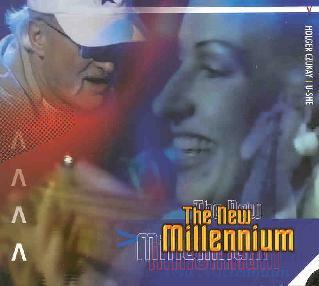 Holger Czukay and U-She - "The New Millennium"
When asked why he called his new album The New Millenium, Holger Czukay apparently said it was because it didn’t belong in the old millennium. Odd, considering on first listening it sounds somewhat like a complicated pastiche of 90’s techno and 80’s retropop. But to make that assessment is to only listen to the surface of The New Millenium. Digging deeper, the listener finds a considerably more forward thinking piece of music than was initially heard. The "sort of" title track, Millenium, does indeed sound like 80’s retro, something New Order might have done 20 years ago. Of course, Holger, as he always does, brings a sense of enthusiasm and freshness to it while many other artists would be content to just re-create a retro sound. From this point on, all the rules change. This album may be quite stripped down drum n’ bass for the most part, but Holger peppers it with interesting things like piano runs from the low end of the keyboard, horn samples, and world touches like the Middle Eastern samples on Rosebud. Two things set this album apart from most of Holger’s other drum n’ bass contemporaries. One is the many bizarre and experimental rhythms that jerk and twitter about, pausing for the odd inclusion of sounds that could be marimbas or glockenspiels, sounding like something Frank Zappa might have done had he lived to see the 21st century. The other is U-She’s extraordinary vocals. Holger was right when he said to me in an interview last year that of the musicians on his new DIGNOSE label, she was, "definitely my most important artist". U-She’s vocals have a great range, from sensual, whispering moans to almost operatic highs, she has the voice Dagmar Krause, Nico, and Ute Lemper, all rolled into one, and it works well with this kind of music. It’s especially interesting when she plays along with the eccentric rhythms with her own unconventional delivery, like on Chittigong where the electronic rhythms are truly bizarre, uneven things that form a unique network of beats around U-She’s playful vocals. Occasionally, with all it’s frantically paced, techno-inspired grooves, it seems like Holger is trying just a little too hard to sound hip and contemporary, but we have to remember that this is a man who was experimenting with hip hop-like rhythms in the early 70’s. This is not Holger trying to sound contemporary by exploring modern techno-rhythms, this is a natural extension of what he’s been working on for years, long before many of the modern artists were into it. Can did some amazing tunes full of grooves and textures and atmospheres, but Holger has always been inspired by eccentric and complex rhythms. The New Millenium may be the ultimate expression of that inspiration. For more information you can visit the Holger Czukay web site at: http://www.czukay.de. The New Millennium is distributed by Fünfundvierzig. You can visit their web site at: http://www.funfundvierzig.com.